Tournament Most Valuable Player Bryce Runyan made 32 saves Sunday as the Texas Brahmas became the first South Division team to win the North American 3 Hockey League’s Fraser Cup with a 2-1 victory over the Lewiston/Auburn Nordiques. The Brahmas went 8-0 through the playoffs, including 4-0 at the finals where they won both games in their pool, the semifinal and final after the six division champions got together at the Seven Bridges Ice Arena in Woodbridge, Illinois. With Runyan and L/A’s Andrew Ghimpeteanu squaring off, neither team scored in the final until Parker Mara converted a rebound for the Brahmas off a Matej Palfy point shot in the final minute of the second period. Alex Rivet tied the game for the Nordiques with 7:12 remaining. Findlay Wood took a pass from Michael Redmon when Texas converted a turnover into the game-winning goal in the final four minutes. Runyan made a total of 96 saves, allowing just one goal in each of his three games at the finals, to earn the MVP award and the goalie spot on the All-Tournament Team. Wood, Redmon and defenseman Palfy also represented the Brahmas on the All-Tournament Team that also included Nordiques forward Valeri Rykov and defenseman J.P. Chauvin. The Nordiques also went 2-0 in their pool before both teams won close semifinal games. Rivet had two goals, including a first-period penalty shot and the overtime game-winner, in a 3-2 victory over the St. Louis Jr. Blues. Runyan made 34 saves for Texas in a 3-1 win over the North Iowa Bulls. Benjamin Lundberg scored the game-winner in the third period and the Brahmas added an empty-net goal after the Bulls pulled Dysen Skinner, who had made 39 saves. The highlight of pool play came when L/A and North Iowa met in the game to decide first place in their pool. The Bulls went ahead by one goal four times before the Nordiques scored the last four goals, including three in the third period, for a 7-4 victory. Logan Jenuwine from the Amarillo Bulls scored two goals Saturday night, becoming the North American Hockey League’s single-season recordholder for goals scored with 56, in an 8-2 victory over the Corpus Christi IceRays. Brendan West had a goal and two assists on Jenuwine’s record-setting night, then had a hat trick the next night in an 8-3 win over the IceRays. The Tri-City Storm clinched the Anderson Cup as United States Hockey League regular-season champion during Friday’s 4-3 overtime loss to the Sioux City Musketeers. The Dubuque Fighting Saints clinched a USHL Clark Cup playoff berth Sunday with a 6-4 victory over the Central Illinois Flying Aces. The Des Moines Buccaneers had clinched Saturday when they shut out the Dubuque Fighting Saints 6-0 on 30 saves by Roman Durny. The Storm (44-10-3-1) remain first in the monthly USHL Power Rankings, presented by USA Hockey Magazine through voting of media members around the league. They’ve already set a team record for wins in a season. The Waterloo Black Hawks move up from third to second, dropping the Muskegon Lumberjacks to third. The Sioux Falls Stampede and Chicago Steel held on to fourth and fifth. Bobby Brink from the Sioux City Musketeers is the USHL Forward of the Week for the second straight week and fourth time this season. Brink is third in the league with 33 goals after having four goals and three assists in three weekend games. Waterloo’s Hank Sorensen, the USHL’s top scoring defenseman, had six assists and was plus-5 in three games. Amarillo Bulls captain Louis Helsen has committed to play at Rensselaer Polytechnic Institute (RPI). The 20-year-old defenseman from Dallas, Texas, has three goals and 15 assists in 58 games along with playing in the NAHL’s Top Prospects Tournament. James Durham, a goalie with Des Moines in the USHL, has announced his commitment to Brown University. Dunham led the NAHL with a 1.57 goals against average and .942 save percentage in 17 games in the 2017-18 season before moving up to the USHL. The 20-year-old from Grand Rapids, Michigan, has a 2.48 GAA and .917 save percentage this season with the Buccaneers. Another USHL player, Youngstown Phantoms defenseman Aiden Gallacher, is among the recent commitments. The 19-year-old from Rochester Hills, Michigan, has committed to Michigan State. He has three goals and five assists in 29 games with the Phantoms. Chase Ernst has been named as the new team president, general manager and head coach of the NA3HL’s Milwaukee Power. 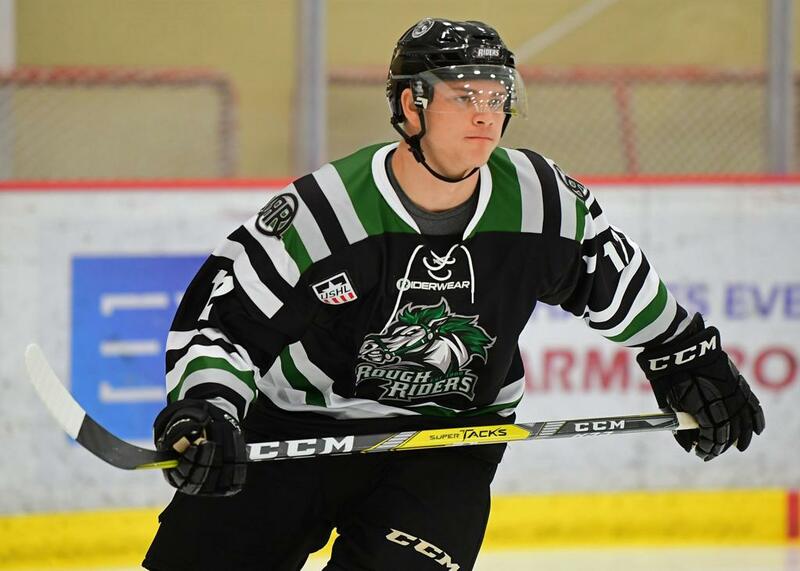 … Aaron Myers scored one goal and assisted the other four Friday when the Minnesota Wilderness posted a 5-4 overtime victory over the Minot Minotauros. … Ben Schmidling from the Springfield Jr. Blues has scored in eight straight NAHL games, including six points in a two-game weekend sweep of the Chippewa Steel.